If you are looking for a home that is traditional and that maintains the customs of your ancestors, our real estate agency offers some cosy townhouses for sale in Torrevieja - Costa Blanca. Fantastic properties located in the interior of the Costa Calida, Murcia. Our townhouses are ready for large living areas so that the family members who live in it can live according to their expectations. Harmony and wellbeing will be the main forms of daily life. All our homes are built in a pleasant and peaceful enclave of Torrevieja - Costa Blanca. Already in itself, Torrevieja - Costa Blanca is known for being a quite peaceful and welcoming city. Its inhabitants are respectful. In this way, if you are looking for a traditional home in a comfortable and easy to adapt city, our townhouses in Torrevieja - Costa Blanca are your solution. In addition to living in a quiet city, the owners of each townhouse can enjoy a city with an enviable climate. Enviable because not only is living comfortably in summer but also because it is pleasantly inhabited in winter. Its summer period is usually very hot, with temperatures above 30º. Its winter period, usually offers mild temperatures, with an annual average of 13º. 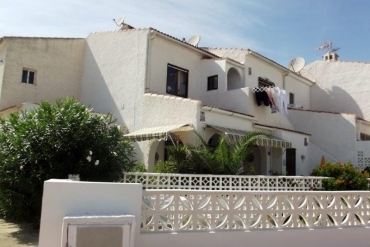 An example of one of our townhouses for sale in Torrevieja - Costa Blanca, has 3 bedrooms and 3 bathrooms. It is a large house, with a total of 350m2 useful. It is oriented to the southwest and its distance from the beach is short: only 45 minutes. The townhouse has a garage, is very close to leisure facilities, has a terrace, air conditioning and several other areas in which the client can go finding out as you live on the property. Get in touch with our real estate agency to access one of our townhouses for sale in Torrevieja - Costa Blanca. You can come visit us at our offices in Torrevieja and La Zenia (Orihuela Costa), located at Calle Bizet Local 6 La Siesta and La Zenia Golf 4B, respectively. You can call us by phone at 0034 966 785 202 (Torrevieja) or 0034 965 083 434 (La Zenia). For other ways of contacting us, you can send us an email to info@casasespania.com with any doubts you may have, before betting on our services.